I'm so grateful our temple has had a very talented President for nearly 20 years. He is an engineer, repairman, plumber, painter, carpenter and very good cook. He has led many repairing projects of our temple and all of his works, skills, efforts and time were donations. I can concentrate on my mission thanks to him. Because I don't need to worry about maintenance of the old temple, I can not only officiate the services but also I can bake and mow the lawn, too. Together with uncle Edwin, he is now fixing this ride-on mower. The fact I can mow the lawn easily is defenitely thanks to them. It's kind of scary to imagine...what if we don't have a repairman. We probably need a lot of money to have it fixed or it can be huge piece of junk. Modern people are very good at producing new prodcuts but not good at repairing. That's why we have more and more rubbish and garbages in our daily life. Without repairmen, they cannot be recycled but can be eaisly become waste. So in the future, repairman will be more and more precious and valuable for our planet. Once again, I am so thankful for our repairmen, especially our President. 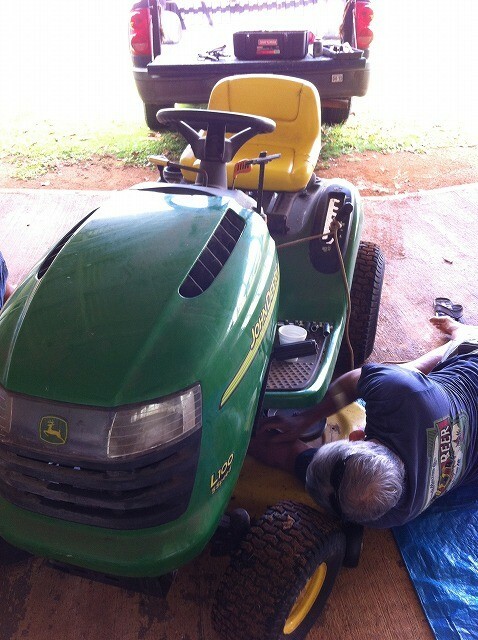 Thank you Uncle Kuni (Alvin) Akimoto for fixing the lawn-mower.